Love this carpet. It fills the room yet has a warm and comforting look. We have received many compliments from visitors who have admired the quality and the modern design. Nourison Expressions Multicolor Rug - 7'9" x 10'10"
Nourison Expressions Multicolor Rug - 5'3" x 7'5"
Complete your home decor with this luxurious hand-loomed rug. 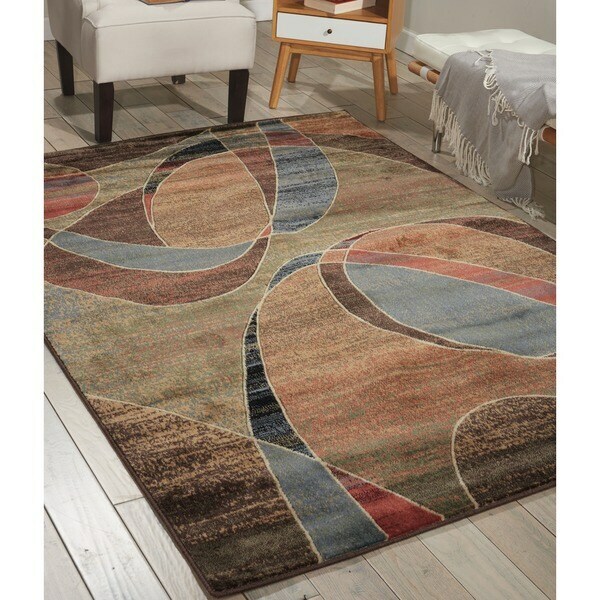 This rug features rich shades of beige, blue, orange, green and brown. Acceptable quality for the price. Searched for a 10 x 14 rug for a long time, and this one was the best value for the money. The rug looks MUCH lighter in person and seems a lot more colorful than I was expecting, was hoping for more browns, and seems more like a cream color. Also not as soft as I was hoping for, but it will work fine for our purposes. Shipping was fantastic, ordered on the weekend, arrived on Wed. I love this rug and it looks great, but it's not going to last long. My guess would be 5 or 6 years tops. When I first rolled it out it was very slick, but every time I vacuum the slickness goes away and the colors get better and better. I've had it about a month now and it's no longer slick and the colors are great. Where the edging on the rug meet is not finished well and looks like it might unravel, but I have that hidden under my couch. I have cats who have always been good about sharpening their claws on the carpet and not furniture, but when the claw this rug they pull out strings that need to be trimmed back with scissors. I don't blame my cats b/c the old rug I had for 10 or 15 years could take it and not lose any strings. If you get this rug just go in knowing you may not have it long term. Very nice thick rug. The colors in this rug are prettier than in the picture. Very pleased. We bought this area rug for our condo living great room...Looks fantastic against the hardwood floor and exposed brick walls... Bought a 3/4" thick carpet pad and the rug feels really soft and you can feel the etching of the shapes built into the carpet... Considering buying the runner for the hallway..
Nice Color a little more vibrant that the picture. Very good value. Soft and lovely. The more you walk on it the better it looks!! Safavieh Handmade Rodeo Drive Modern Abstract Blue/ Rust Wool Rug - 9'-6" X 13'-6"